A few weeks ago I stood atop Stora Klif, the highest point on Heimaey Island with three friends. It was day four of our ten-day Iceland Georney, a biennial field trip to some of the world’s most geologically unique places planned by the UPS geology department. We gazed out over the small island, which was affected by a volcanic eruption in 1973. 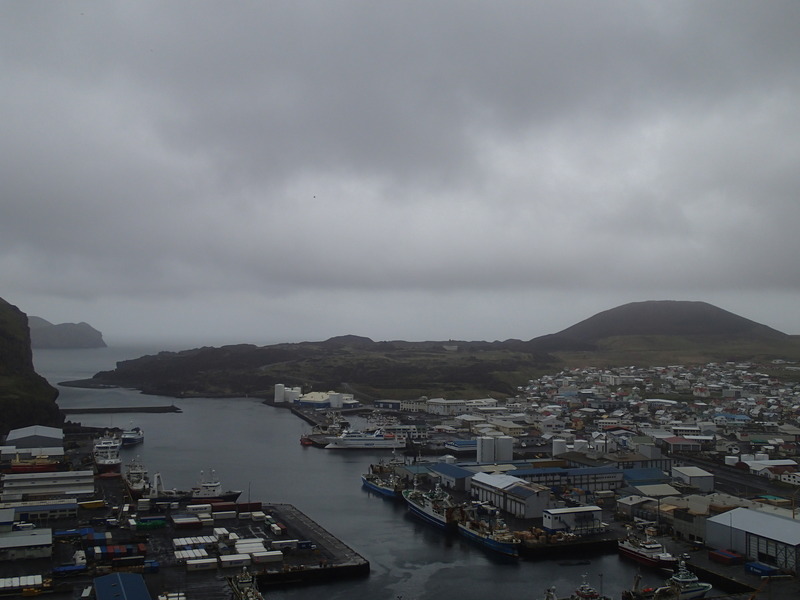 Heimaey is the only inhabited island in the Vestmannaeyjar archipelago, so when the eruption occurred all the residents had to evacuate while their town was partially destroyed by the lava flow. The lava spewing from the Eldfell Caldera slowly added landmass to the island and threatened to close off the only harbor by advancing into the chilly waters of the North Atlantic. In order to save the island’s fishing industry, the Icelandic people sprayed water on the marginal edge of the flow and cooled the steaming lava (read John McPhee’s The Control of Nature if you want more details). As a result of this great effort, the harbor was left exposed to the open ocean and the fishing could resume. The lava stopped advancing and cooled into solid rock. From our vantage point on Stora Klif, you could clearly see the newest lava flow locked in time until repeated wave action, perhaps for a million years, inevitably erodes it away into sand. The view from halfway up Stora Kliff. 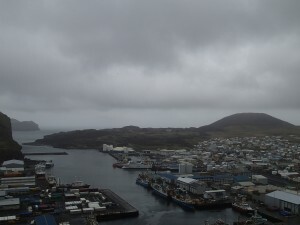 The village and harbor can be seen, as well as the 1973 lava flow and the Eldfell volcano above the town. 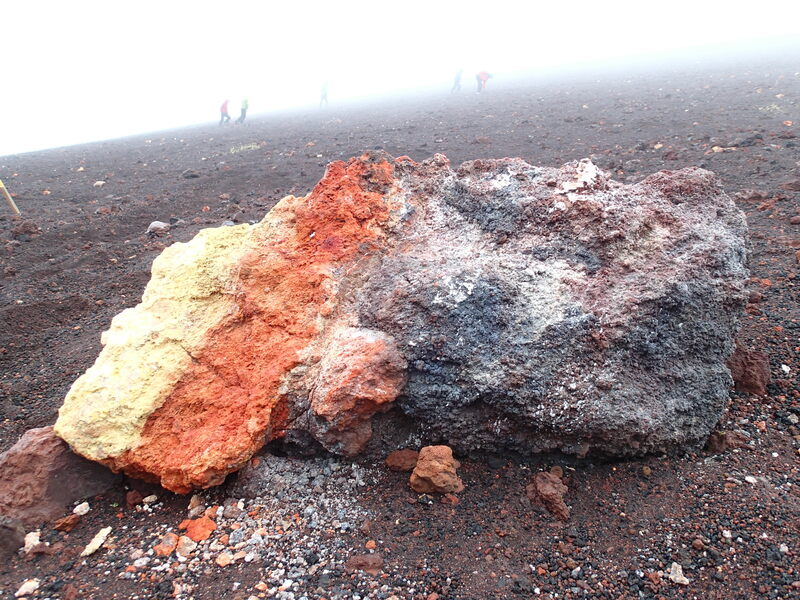 A multicolored volcanic “bomb” from the 1973 eruption. After returning from Iceland, my work as a summer researcher began. I am working with professor Kena Fox-Dobbs and several other researchers from universities scattered across the country. This National Science Foundation project seeks to understand climate and environmental change with different chemical tools and proxies. 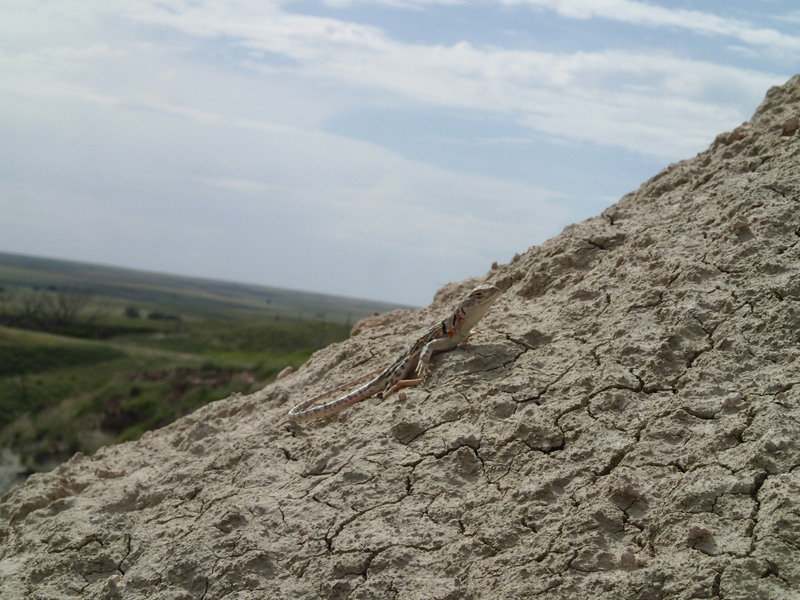 I traveled to the Meade Basin of southwestern Kansas, where Claude Hibbard first cataloged one of the most fossil-rich sites in North America. Everywhere we collected samples it took only a few minutes of searching to find fossilized bone and teeth falling out of the ancient soil. Fossil research in this area has occurred for seventy years and it was not until recently that research produced more questions than the assemblage of fossils could answer. 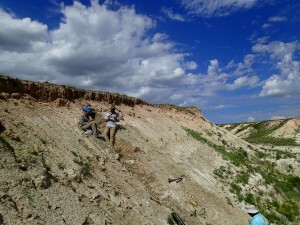 The current Meade team works with Bob Martin, who knows the area and its fossil sites better than Hibbard himself. Thanks to his hard work and good standing with the local landowners, our team is seeking to answer some of the questions that have arisen in studying changes in the animal communities. Through studying different snapshots of time in the surrounding units of soil, we hope to collect data that can reflect the environmental conditions that caused these changes. My goal is to collect soil samples with great enough resolution in order to tell a story of plant life on the surface for the last 5 million years. 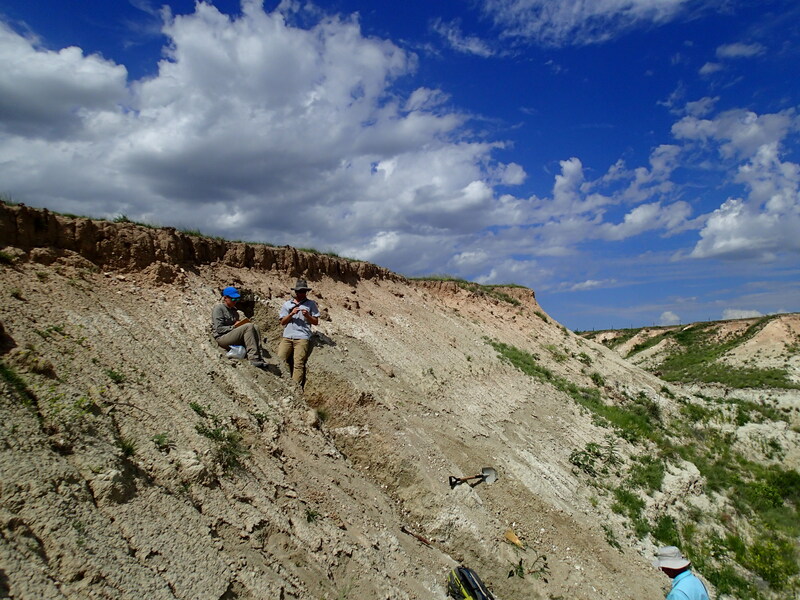 From previous studies within the Great Plains, we know that the modern grassland ecosystem in North America evolved around this time. Working with the Meade team in the field was one of the hottest and most spectacular weeks of my life. The whole group is made up of some really great people, who like being outside, talking science, and enjoy one another’s company. While digging in dirt all day in 90° heat without shade, might not seem like a spectacular way to spend one’s summer, it was the people that made the fieldwork such a joy for me. It was interesting to observe how everyone with their own projects and goals in mind could find a way to work efficiently in the field and truly enjoy the work. Being an undergrad surrounded by PhDs, post docs, and graduate professors was intimidating at first. However, I quickly learned that while the PIs were very intelligent they were also down to earth and willing to answer any stupid question I was stupid enough to ask. In Meade and on Heimaey we were oblivious to what was occurring in the outside world. We took the time to appreciate the Earth and its many incredible processes. While we stared at a lava flow frozen in time or logged the paleosol horizons in Borcher’s Badlands, we were not wrapped up in the present, with thoughts of our families, world events, and celebrities, but we were people gazing into the past. In Meade, we trenched the soil that camels and rhinos walked upon, that saber-toothed cats peed on. We don’t yet have the ability to travel through time, and probably never will. However, the rocks and soils that make up the mountains, cliffs and ground under our feet give us snapshots into the past. The Meade project is trying to develop tools that will get us pretty darn close to knowing exactly what the environment looked like and ultimately enable others to use these tools in other areas. The more that is known about this time and place, the more it is apparent that we don’t know much at all. Such is science. Through a greater understanding of the world’s past ecosystems, climate, and species, we can better understand how our current landscape came to be, and figure out where the Earth is headed. Many mornings in Kansas were spent wrangling small rodents, cataloging them, and taking hair samples to determine their diets. The Onychomys was a common sight. I developed a new appreciation for these stubborn, aggressive, smelly creatures. This video sheds some light on the simultaneous beauty and brawn of the mighty grasshopper mouse. Keep an eye out for my next entry I’ve decided to call Lab Rat. Happy Solstice! The Borcher’s 4 section in the Meade Basin, Kansas. The Huckleberry Ridge Ash is visible as the white layer about a meter above the shovel. This ash is from an eruption in the Yellowstone Caldera and dated to be 2.1 million years old. 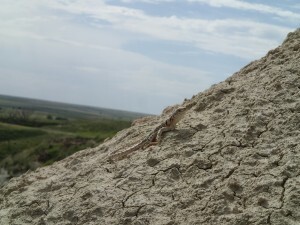 A lizard friend in Borcher’s Badlands.